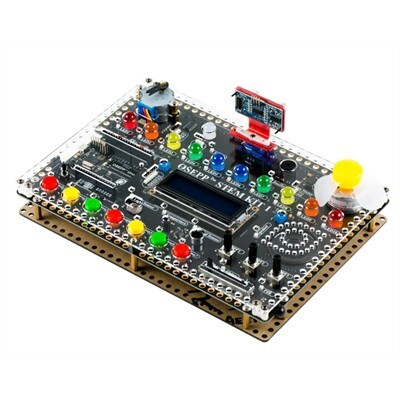 STEM KIT1 is the hardware board when used with OseppBlock IDE (Integrated Development Environment) becomes the ultimate tool for anyone wanting to learn how to code. Whether you are in Elementary school or University, a teacher, a parent or a grandparent, you can learn to code in the Arduino language. Absolutely no experience required. The OSEPP™ Stem Kit1 will teach you the eight most commonly used inputs and outputs in the Arduino environment. Once you have mastered these functions using the OseppBlock IDE, you will be well on your way to programming using the Arduino IDE without the graphical ‘block’ support. All the devices listed above are on ONE circuit board. This way, minimal time is spent ‘jumping’ cables from one module to the next and more time is spent on actual learning. It is as easy as learning the ABCs. Copyright © 2019 by Circuit Test Electronics All rights reserved.